I know, I know you haven't heard from me for awhile but I have been doing my course and not much else...I know that I shouldn't have spent all my half term painting and sewing - and now I'm paying for it. I have to have completed 4 (at least) assignments by this Friday and it is taking me ages to finish though today I feel at last that I can see a small chink of light at the end of this tunnel. I'm really not cut out to do study - does it take others so long I wonder?! When I look at what I have done I'm pleased with it ..but does it take 8 hours or longer to do one task!! I keep changing it and rearranging! 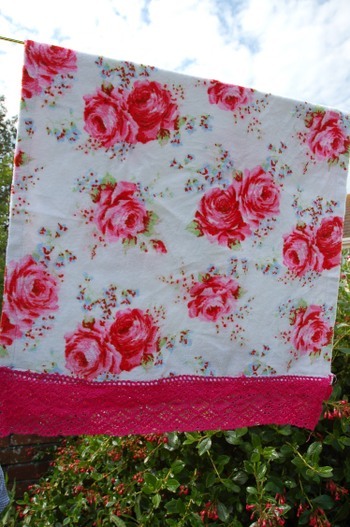 My last 'job' last week before I returned to my studies was to add some cerise lace and shorten a Cath K hand towel. This now is our new bath mat! Please accept my apologies to not returning e-mails etc and I promise in a week or three I hopefully will be back to normal...ummm...me normal...I'll rephrase...back to sewing, shopping, hunting (treasure of course), painting, laughing, my camera, reading, Coldplay (yeah I've gone at least 3 days without losing myself in Chris' beautiful songs) gardening...me!